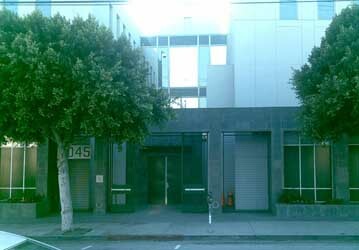 Hijackers Already Living with Al-Bayoumi - Furthermore, there is evidence the two hijackers actually stayed in al-Bayoumi’s San Diego apartment from January 15, the day they arrived, until the day after this supposed meeting (see January 15-February 2, 2000). 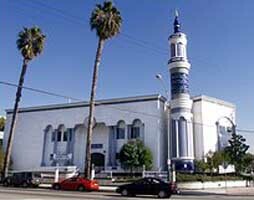 The King Fahd Mosque in Culver City. [Source: Damian Dovarganes]Hijackers Khalid Almihdhar and Nawaf Alhazmi travel to Los Angeles with an associate, Mohdar Abdullah, before Almihdhar leaves the US the next day (see June 10, 2000). When they visit the King Fahd Mosque in Culver City, Abdullah is surprised that Alhazmi and Almihdhar already know several people at the mosque. Abdullah will later say, “I was surprised that anybody at the mosque knew them, because as far as I knew Alhazmi and Almihdhar hadn’t visited Los Angeles since they arrived in the US.” They meet one of the hijackers’ Los Angeles acquaintances, known as Khallam, again later that night at their motel. According to the 9/11 Commission, Khallam asks Abdullah to leave the motel room, so he can talk to Alhazmi and Almihdhar in private. However, Abdullah will later dispute this, saying he is not asked leave the room, but that Alhazmi leaves to make an international phone call from a pay phone. The identity of the person he calls is unknown, but it is possible that he talks to Ahmed al-Hada, an al-Qaeda operative whose safe house is monitored by the US and who Alhazmi sometimes calls from the US (see Early 2000-Summer 2001). Khallam will apparently never be found after 9/11. The FBI will consider the possibility that he is Khallad bin Attash, as there are some reports that bin Attash is in the US at this time and met the mosque’s imam, Fahad al Thumairy. However, this theory will never be confirmed. [Los Angeles Times, 7/24/2004; 9/11 Commission, 7/24/2004, pp. 216, 514] The next day, Alhazmi, Abdullah and an unknown man make a casing video at Los Angeles Airport (see June 10, 2000). It is possible that the third man is Khallam. 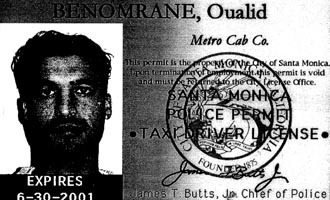 Qualid Benomrane’s 2001 tax driver license. [Source: FBI]The FBI interviews Qualid Benomrane, an Arabic-speaking taxi driver who had done chauffeur work for the Saudi consulate in Los Angeles. Benomrane is shown pictures of young Arab men and asked if he recognizes any of them. He quickly picks hijackers Nawaf Alhazmi and Khalid Almihdhar out of the line-up. After realizing they were 9/11 hijackers, he denies knowing them. The FBI asks him about his ties to Fahad al Thumairy, an official at the Saudi consulate suspected of a link with those two hijackers. Benomrane says that al Thumairy introduced him to two young Saudi men who had just arrived in the US and needed help. Benomrane drove them to places in Los Angeles and San Diego, including Sea World, a theme park in San Diego. [Shenon, 2008, pp. 309] (Curiously, these two hijackers bought season passes to Sea World.) [Los Angeles Times, 9/1/2002] 9/11 Commission staffers will later conclude it is highly likely that the two men were Alhazmi and Almihdhar, despite Benomrane’s later denial. This would mean al Thumairy knew the two hijackers. [Shenon, 2008, pp. 309] However, the 9/11 Commission will fail to mention anything about this in their final report.